Susan decided that my 40th birthday should be a special one. 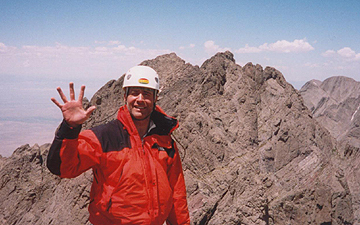 She worked with my climbing partner, Brian to setup a weekend trip to do something “special.” Brian thought that the Crestone Peak – Crestone Needle traverse would be a suitably exiting adventure. I was delighted with the idea beyond all reason, but still I couldn’t help but think about doing more. 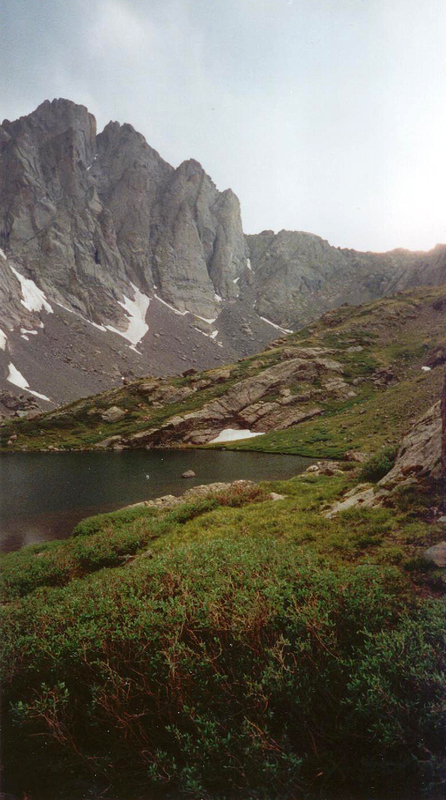 I kept thinking about the other Fourteeners in the area and about how this would be the ideal time to bag them. The Kit Carson, Challenger and Humboldt mountains were within a few miles of each other and the Crestone massif; I developed what I would later call my “Crazy Plan” to get them all. 5 Fourteeners in 2 days. To be honest, I wasn’t entirely convinced we could do it. I just knew that if we thought big, we could accomplish a lot. This was my argument to Brian. He was dubious, but was convinced that, logistically speaking, we had a chance to do 4 in a day, leaving Humboldt for a short second day (he needed to head back early). It was a slim chance, but it was a chance. The “Crazy Plan” was a go. Brian got off work around 6pm on Friday, which is in itself a miracle. I met him at his place at 6:30pm and packed my stuff into his truck. We left Golden toward C-470 and eventually hooked up with I-25 South toward Colorado Springs. We then took Hwy 115 South to Florence, from which we took Hwy 96 to Westcliffe. We then took Hwy 69 south for 4.5 miles to Colfax Lane, which we took (right turn) to a T-junction. We made a right turn onto county road 120 which led directly to the passenger car trailhead. Of course Brian wouldn’t dream of walking the 5 miles to the 4X4 parking lot. I think the opportunity to take “one of Colorado’s toughest” roads was the primary reason for his interest in the trip. The drive did beat walking, but just barely. The 5-mile drive in took 1.5 hours. We hit the 4X4 parking lot at midnight, and then hiked in the dark for 1.6 miles (1 hour) to reach the upper lake where we found a nice spot directly below the approach trail to Humboldt. A quick camp setup, including a jury-rigged food hang using a couple sticks and a few rocks to overcome the lack of trees, and we could rest. And at 2am, we turned in for a few precious minutes of sleep. A view of Crestone Peak and the rim to the Bear's Playground. Our route took us directly to and over the rim. The alarm went off at 5am. I felt certain that I had slept at least some of the time. With a full day of adventure and effort ahead of us, we began by unpacking everything we could possibly do without to save weight on a long day. By 5:30am we were hiking NW to exit the South Colony Lakes basin into the Bear’s Playground. We mounted the rim around 7:30am and decided to stash our ice gear for the return to the Crestones. We continued NW to reach the ridgeline on which summit Point 13799, Kat Carson/Columbia Point (13,980), Kit Carson (14,165), and Challenger (14,081) stood in sequence. While planning the trip, I had figured on 2-3 hours to cover the 4 mile round trip from the Bear’s Playground. Instead, it would take us 5.5 hours of hard hiking and scrambling. Some stretches of 4 miles are harder than others. The ridge line was straight and easy to follow, but had a wild degree of elevation gain and loss: 13,140 (Bear’s Playground) up to 13,799 (Point 13799) down to 13,460 (saddle) up to 13,980 (“Kat Carson” or “Columbia Point”) down to 13,620 (saddle) up to 14,165 (Kit Carson) down to 13,780 (saddle) up to 14,081 (Challenger Peak) – a total of 3,109 feet gained (and lost) on the round trip from the Bear’s Playground and Challenger Peak. 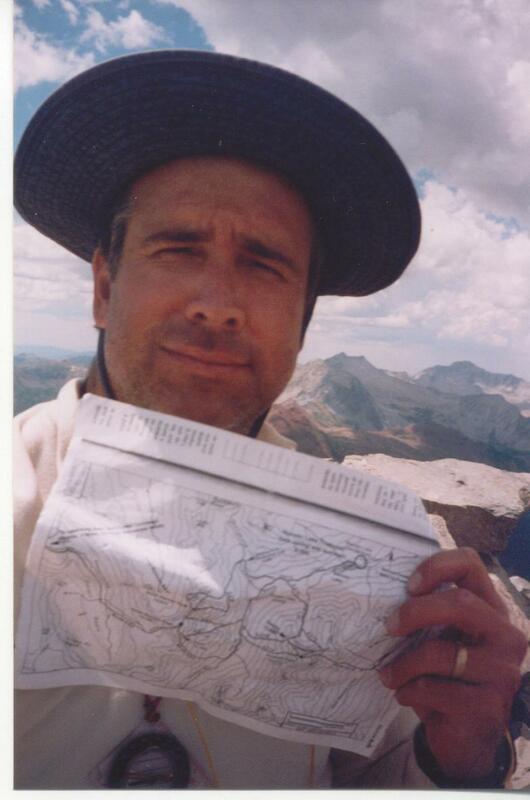 After a short break on the Kit Carson summit, we couldn’t find a route west toward Challenger Peak. In our haste, we decided to just start downclimbing; we figured we find a way. It turned out that the downclimb to the west of Kit Carson is 4th class plus (I found a piton on my decent) and the proper route descends to the east (back to the Kit Carson-Kat Carson saddle) and then skirts the southern flank of Kit Carson. Sitting on the Challenger summit and wondering out loud about the unexpected difficulty, we noticed the correct route. Better late than never! We took the standard route back to the Kit Carson-Kat Carson (or Columbia Point) saddle, and continued toward the Bear’s Playground, shaving a few feet here and there. We made it back to our stashed gear by 1pm, and we were tired and dehydrated. Still, I had the “crazy plan” to complete and the weather was holding. I wanted to push on to do the Crestones as we planned. Brian thought it would be risky, but would proceed if I insisted. 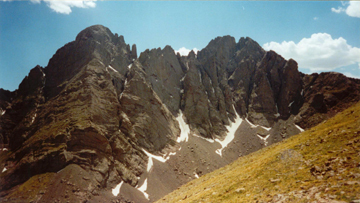 I was thinking we needed to do the Crestones immediately to get all 5 Fourteeners before leaving for home. On the drive out from Golden, we figured it would take 6 hours to do the Crestones. Sitting beneath Crestone Peak at 1pm, we reassessed to 8 hours, which would allow us to just finish before dark, assuming we didn’t get tired (and slow) or have route finding issues or lose our good weather. I could see it was a bad bet; but I really wanted it. Then it occurred to me that if we finished Humboldt today instead, we could do the Crestones on the final day if Brian could stay long enough. We settled on a new plan that included an extra early start on day 2 and a promise to go fast, and we headed north for the Humboldt saddle. When we reached the saddle at 2:30pm, Brian decided to head to camp to rest his legs (he had already climbed Humboldt on an earlier trip) while I pushed on to bag the summit. With the thrill of a new peak, I started up with a strong pace… that didn’t last. This speed transition marked the arrival of Toadman. After the initial few minutes, my pace resembled the motions of a toad; I made short bursts of distance followed by serious resting in a bent-over or squatting position. I feared my lungs would wear out from overuse. I only needed to gain 0.7 miles and 1,200 feet in elevation, but I had not had a drink since 1pm and was already dehydrated at that point. I was bonking big time. And, my feet were two giant hot spots. Anxious not to use up my sleep and resting time, I hobble up the peak as hard as I could. A short rest on the summit without water didn’t do any good, so my slow pace continued all the way back to camp. I arrived at 5:30pm – totally spent. Upon my arrival, Brian stirred from the tent. We arranged dinner while I drank the water Brian had thoughtfully filtered. He asked me how much water I was going to drink; I told him I was going to drink it all. My word was good on this point. We drank and ate and enjoyed the entertainment of the resident Marmot community. They were amazingly lively in their barking and shrieking at each other. A few even engaged in wrestling. One weathered fellow, with two serious bite scars on his face, was determined to join our dinner party and sat next to me for a short time. At 7pm, I hit the bag and was gone to the world of the living. Compared to the 1-2 hours of actual sleep I got the night before, the 9 hours promised seemed to good to be true. It was. I managed about 7 hours, losing the other 2 to various physical issues and necessities. But 7 hours is pretty good. The alarm went off at 4am and we exited the tent into a dark world. I stumbled around while eating, drinking and packing, and managed to spill my water like the careless fools I’d judged harshly in the past. Desperately wanting lighter packs, our views of the NW Couloir the day before convinced us we could leave the ice gear behind. 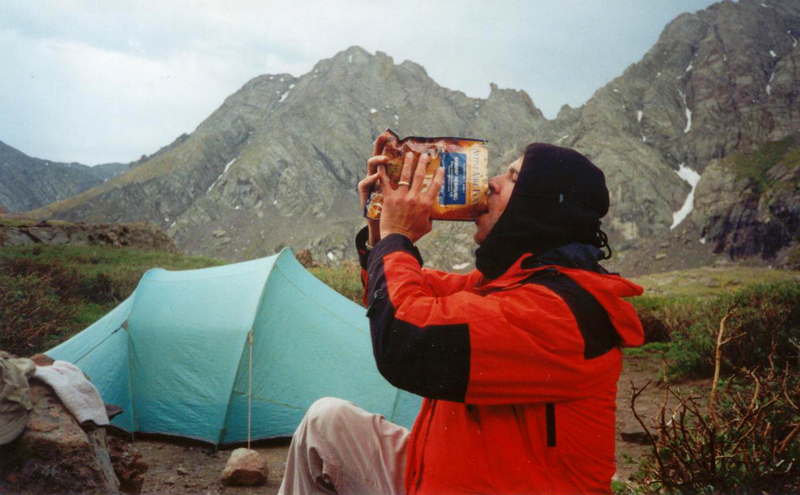 And by 4:30am, we were heading back up to Crestone Peak’s NW couloir…with a short stop to collect water at the lake. I felt like a somewhat rested toad, a toad with sore feet and leaden legs. But that was good enough. We took a somewhat different route out of the South Colony Lakes basin this time, aiming to come out nearer to the Crestone Peak. After a bit of extended 3rd class scrambling, we exited the basin near our objective. Once out of the basin, we oriented ourselves with a map and compass, and followed a set of cairns that seemed to head in the right direction. Fairly quickly we found the NW coulior. Up we went into the wet, crumbly rock couloir that was mostly devoid of ice. The rock was so unreliable that I felt that I was taking significant chances throughout the morning; the risk felt greater here anywhere on the trip. We reached the summit with with injury only to my wits around 9am. Success for the day depended on completing the traverse on time, so we took a break to study the terrain. I couldn’t make any sense of it other than the start, which was to descend the 3rd class south facing couloir. Hoping to find clues along the way, we returned to the top of the NW couloir (which was also the top of the south facing couloir as well) and began the “traverse”. We descended 250-300 feet per the instructions, and then we were completely confused. We wandered up and down the left side of the couloir looking for a trail of breadcrumbs or big red footprints or some other clue as to the route of “one of the four great Colorado traverses”. 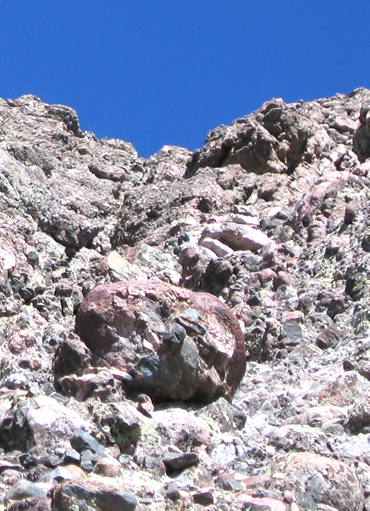 During this fun, I discovered the perils of crestone conglomerate rock; I was stepping around a corner, standing on a beautifully rounded river boulder protruding from the rock face when “crack” and I was on my way to the bottom of the couloir and the afterlife. Somehow I managed to claw my way back onto the ledge with injury only to my left shin and knee, and again to my wits. While I was playing on the rocks, Brian followed some cairns, which seemed to mark a trail distinctly different than the one the guidebook suggested. I was too far away to make much protest, so I hurried to catch up climbing up some nameless couloir off to the left (north) of the south facing couloir. Eventually, we found ourselves too high, but within reach of a recognizable portion of the route. We scrambled down to the 13,740 foot saddle between Peak and Needle and descended a well worn trail down another south facing couloir looking for the traverse beneath the 13,940 peak along the ridge (“go well below this summit on a good ledge system on the south side of the ridge.”). We didn’t find it; instead, we descended to the bottom of the couloir and crossed over to the west facing couloir beside the Needle and ascended until we could reacquire the traverse route. We had additional difficulties finding the proper rock to climb up to the ridge, and simply climbed up a 5th class face using the rock gear we had carried with us for two days. Once we were 200 feet above the couloir, we were able to find the route again and wind our way toward the final 100 feet of 4th class climbing to the summit. We had brought the rock gear just for this final push, but the rock did not appear to provide any opportunities for protection. So we put it away and just scrambled up. The climbing was easy but wickedly exposed. A fall from this stretch could give you a long time to regret the mistake. On the way up, I kept looking at the empty sockets (where stones had fallen out) and thinking about the river stone that came loose from the conglomerate earlier in the day in an attempt to throw me down the south facing couloir of Crestone Peak. It took a considerable effort to stay focused. We reached the summit at 12:15pm. It had taken us just over 7 hours and we still had 3 hours to go. We were running late. Still, if we had started the traverse at 1pm the previous day, it would have been a disaster. I was tired, but it sure felt good to finish the 5th 14er. We had done it; we had completed the technical portions of the “Crazy Plan”. All that was left was the descent. And the descent was endless. These Crestones were hard to get to, hard to get up and hard to get off. We followed the cairns with only a single wrong turn. Eventually we made our way to the top of the gully that led back to the South Colony Lakes basin. The trail seemed to want us to go the east end of the Lower South Colony Lake…a significant detour. So we headed west to find a way down the cliffs that guarded the approach to the Upper lake. Eventually we found a goat or sheep trail that allowed us to traverse the scree beneath the Needle and minimize any elevation loss before reascending to the upper lake. I reached the camp at 3:30pm after refilling one of my water bottles at the lake to let the iodine tablet dissolve while I packed up the camp. I was so tired that I packed my gear while lying down. Think about how hard that is…well, sitting up was harder. And I kept checking that damned iodine tablet, hoping to find that it had dissolved. But it would not. Finally I mustered the courage to start hiking again. We left for the car around 4pm, about 3 hours later than planned. The hike out felt better than expected, but was another in a long line of endless marches (“death marches” is what I call it when in one). I dispelled some of the boredom by counting. First I made sure that the trail markers (I don’t know what they were marking) were all exactly 42 steps apart (and all 45 markers were exactly 42 steps apart). When the markers ended, I took to counting the steps from the last marker to the car. I guessed, based on nothing but hope, that the car was one thousand steps away (a nice large round number). I figured that the car would actually be closer, but by “hoping” to be right about the step count, I would be somewhat distracted from the long hike out. It didn’t work out; there were one thousand, eight hundred, seventy-two steps to the car. But at least the hike was over. All we had left to do was survive the 5-mile drive out to moderate roads and then the drive home. The 5-mile offroad portion took another 1.5 hours, but the truck survived, and the remaining four-hours drive back to town seemed to go quickly. We arrived at Brian’s place around 10pm; I arrived home 30 minutes later to thank Susan for a great birthday. All in all, we achieved 5 Fourteeners and 2 high Thirteeners, 15 miles of hiking and 8,000 feet of elevation gain in two great days. I’m glad I didn’t wait until my 50th birthday.